STRAX Intelligence Group provides Aerial Intelligence & Real-Time Situational Awareness Solutions in one common operating picture for Public Safety and Security. Our philosophy is to provide best-in-class, end-to-end solutions and service that leverages our expertise in advanced UAS flight operations, complex technologies, and real-world operations. The company’s STRAX® Platform and IER® Intelligent Event Response technology delivers data intelligence and advanced analytics – unifying UAV/drone feeds, aerial and ground tactical operations, real-time video, location information, connected devices, and equipment for smarter, faster response. A common problem in today’s data and technology driven environment lies in a complex disparate network of legacy systems, applications, equipment, and devices. This is further complicated by ever evolving technology. 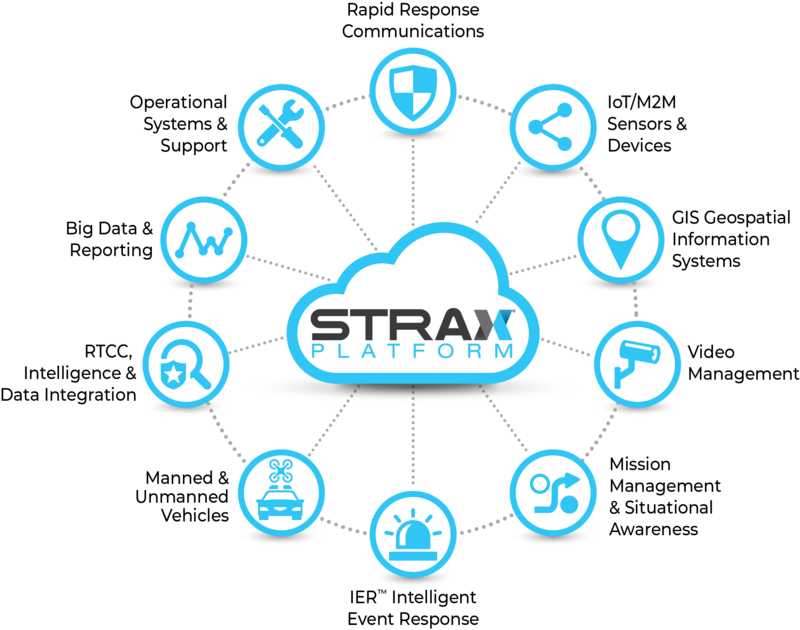 STRAX Intelligence Group solves this problem by unifying disparate operational eco-systems of applications, IoT devices, imaging equipment, manned and unmanned aerial and land assets, data and advanced analytics into the STRAX Platform. IER, the “intelligence” behind STRAX, automates responses based on agency rules, assigned roles and integrates advanced analytics to deliver real-time tactical intelligence to responders, commanders and analysts. Every agency and its operational teams have different intelligence, operations, equipment, and integrated IoT data needs. STRAX Intelligence Group provides a cost-effective, flexible, and scalable approach to implementing aerial intelligence and real-time tactical solutions. Whether your focus is on actionable intelligence for live incidents, Real Time Crime Center (RTCC) integration, or event management, our team will work with you to develop a solution that can scale as your needs grow. Our experts work closely with customers to evaluate your Real-Time Tactical Intelligence needs and complete a plan for implementation and success.